One of the many things we do here at W5 is follow up on our stories. In some cases the response from you, our viewers, lead us to investigate other facets of a story and sometimes the story we report on is worth a follow up. This week’s report, Conning Canada, is one of those. We first reported on Sandra Gordon in 2006 as part of our investigation Criminal Immigrants. Back then we revealed that Gordon had a long criminal record and was under a deportation order. But when we aired the story her appeal of that deportation order had not yet been decided. Sandra Gordon was 16 years old when she came to Canada from Jamaica in 1972. In 1975 she was convicted for theft. A year later she was charged again this time for theft, attempted fraud and public mischief. Later in 1976 Gordon was ordered deported. She fought that order and it was overturned in 1978. In 1988 a fraud charge led to a 30 day sentence. In 1990 Gordon was caught in possession of counterfeit money and handed another stint in jail. In 2001 she was convicted on 22 counts of loan fraud. Over nearly four decaes Gordon racked up a long criminal record. Over the years we kept investigating, trying to learn more about Gordon. And then, in the summer of 2012, we learned that she was still in Canada and back in a Toronto court this time for driving with a suspended licence. Upon this discovery we sought to establish the status of her various appeals before the courts. 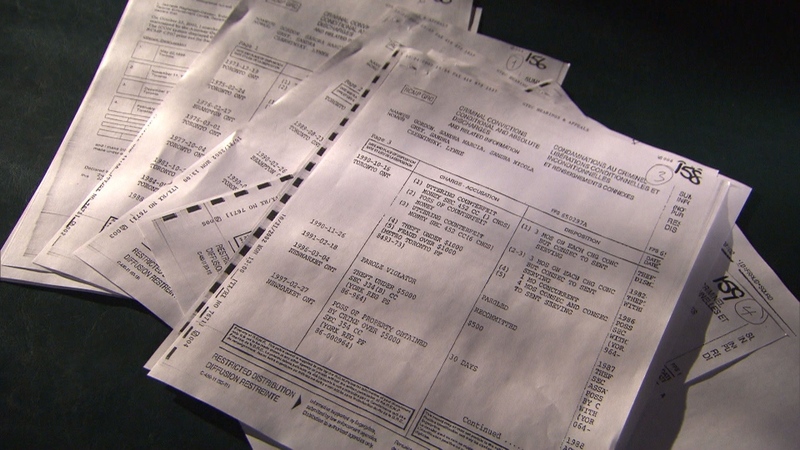 We went back and reviewed a Removal Order from Oct. 13, 2006. Her appeal was dismissed and the ruling stated “granting of another stay would not be appropriate application of the panel’s discretionary jurisdiction.” Then we looked at a Federal Court ruling from March 14, 2007 that stated; “This application for leave and for judicial review is dismissed.” Two months later Justice Gibson confirmed that decision. So why was Gordon still in Canada? We wanted to see as many documents as possible about Gordon’s case. We had obtained her criminal record and it showed dozens of convictions for everything from credit card fraud to loan fraud to obstructing police. Naturally we wanted an explanation for Gordon’s continued presence in Canada. Because Canada’s privacy laws protect individuals, we filed a series of Access to Information requests. Another request went to the Canada Border and Services Agency. On Jan. 3, 2013, it too denied our request because the information is “not publically available” and we required the consent of Sandra Gordon to see any information. Finally, we were told that old records of the Immigration Appeal Board are now held at Library and Archives Canada. After a visit to the Archives and a meeting with a librarian we were told to file an Access to Information request. On Dec. 21, 2012 we received the response from the Archive. An initial search “found possible relevant information” but the Archive had a surprise for us. A price tag of more than $30,000 to review files from a public proceeding that had now been sent to a government warehouse. That bill was more than we were willing to pay. W5 was at the court in 2012 when Gordon left after her conviction for driving with a suspended licence and we approached her to find out why she remained in Canada. W5 had obtained a 2001 deportation order against Gordon that she signed. But, confronted by Seamus O’Regan, Gordon denied having a deportation order against her and ran from our camera. We followed up and visited two addresses she had provided on official documents from 2011 and 2012, which W5 had uncovered. In the first case the owner of the house, where Gordon had listed her address in 2011 said she had not lived there since 2010. He had no forwarding address for Gordon. The second address, a house in Newmarket, Ont. is owned by Gordon’s mother. She refused to speak with us or tell us where Gordon is living now. Nevertheless, Sandra Gordon’s current status remains a mystery. We know Gordon applied for permanent residence status and her application was processed in 2011. We also know that Gordon received a letter about her application in June 2012. But the letter she received remains protected by privacy laws. We don’t know what her status is today. We do know that in the summer of 2012 Sandra Gordon, a convicted criminal many times over, was free to walk the streets of Canada. The Sandra Gordon case is one we will continue to investigate. Sandra Gordon was ordered deported in 1976. As of the summer of 2012 Gordon, a convicted criminal many times over, was free to walk the streets of Canada. Sandra Gordon has racked up a long criminal record since coming to Canada at the age of 16 from Jamaica in 1972.